Posted on May 29, 2014 by Peter Schilling Jr.
We close out our wonderful Alec Guinness Centennial with the David Lean epic Lawrence of Arabia. This nearly four hour masterpiece is like digesting a great novel in one evening–you emerge from the theater shaken, a bit overwhelmed, maybe a tiny bit starstruck, and better for the experience. Add to that the fact that this may be the last time Lawrence is screened on 35mm, like, ever. You can’t beat this for a brilliant summer night’s diversion. Besides, what else are you going to watch? X-Men? This is the movie that made Peter O’Toole a star, and it seemed to weigh heavily on him the rest of his career. Guinness, for his part, plays Prince Faisal, the King of Syria and Iraq. Supposedly, Guinness did such a great job that many people mistook him for the real Faisal while visiting the set. 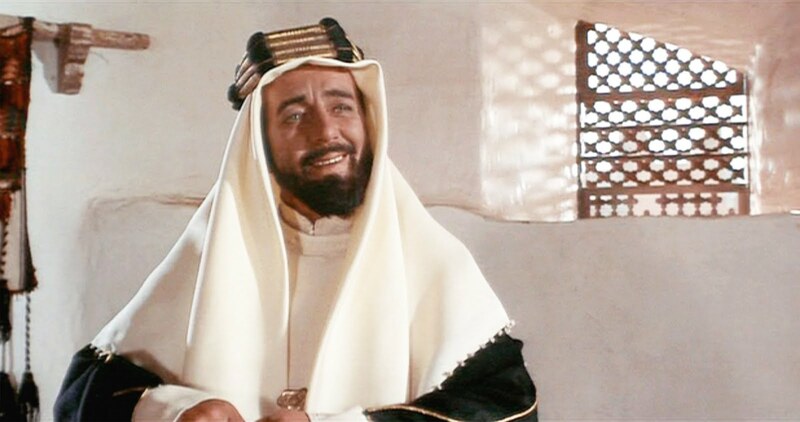 He also claimed to have learned his accent from co-star Omar Sharif. Lawrence of Arabia also holds the record for being the longest film ever to win Best Picture. Don’t miss this rare epic screening! Lawrence of Arabia screens at the Trylon Friday and Saturday at 7:00, Sunday at 5:00 (please note ONE SHOW PER DAY.) Purchase tickets here. Posted on May 28, 2014 by Peter Schilling Jr. The Trylon and Heights Theater’s 1939: Hollywood’s Zenith series begins at the Heights on Thursday night, with Frank Capra’s acclaimed Mr. Smith Goes to Washington. Mr. Smith Goes to Washington review by Trylon regular Ben Schmidt. In roughly a month, Michael Bay’s new Transformers movie will flicker to life in theaters across America. In its latest trailer, we’re teased with a scene in which a large robot (man) rides into battle atop another, larger robot (dinosaur). Honestly now, shouldn’t that be the whole bit? Faced with the breathy promise of fire-breathing theropod robotic locomotion, most of us are either all in or all out. Point being, for those who aren’t eagerly awaiting Bay’s latest installment of constant motion and àla carte idealism, I prescribe its polar opposite, Frank Capra’s Mr. Smith Goes to Washington. This is the perfect time to (re)visit a film whose arresting power comes to stand in the complete absence of motion. Where the strength of a young senator’s idealism is pushed to the limits, as he must filibuster, refusing to yield the floor of the Senate in order to defend both his honor and his ideals. So iconic is Stewart’s performance in these filibuster scenes, it’s easy to overlook the rest of the film entirely. Snippets from Smith’s third act are often featured in awards shows and are easily accessible online. Because really, who can make the time? On Thursday evening, choose to sit in witness of Mr. Smith as if perched high up in the Senate gallery, cringing as the deck is stacked again and again against the titular hero of this film. And at the end of it all, when Jefferson Smith has all but been crushed, marvel as Capra stubbornly refuses to send in the cavalry, dino or otherwise, to save the day. For of the two directors, Capra is certainly bolder than Bay, believing that our job as citizens is to cling dearly to that which is most good and true. And by doing so, we give truth the power to remain standing, even when our legs have given way. 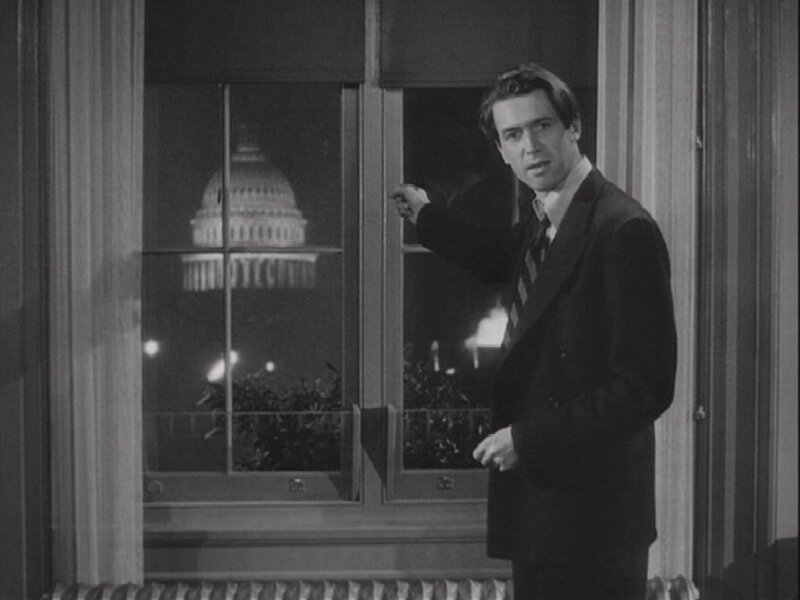 Mr. Smith Goes to Washington screens Thursday night at 7:30 at the Heights Theater. Purchase tickets here. Posted on May 25, 2014 by Peter Schilling Jr. The Trylon’s celebrated Alec Guinness Centennial continues with our final Ealing Studios comedy, Kind Hearts and Coronets. In a few short weeks, the Tony Awards will take place at Radio City Music Hall. More likely than not, A Gentleman’s Guide to Love and Murder, nominated for a leading 10 awards, will take home a haul, including Best Musical. While I was lucky enough to see this very entertaining production on a recent trip to New York, I could not help but find myself comparing it to another work that shares its source material (Roy Horniman’s 1907 novel Israel Rank: the Autobiography of a Criminal). That work is, of course, the classic Ealing comedy Kind Hearts and Coronets, a personal favorite of mine, and, as far as I am concerned, a bona fide masterpiece. Both works share the ludicrous and ingenious plot of a discarded distant heir to nobility systematically knocking off his eccentric and pompous relatives to attain status, but it is Kind Hearts that ultimately proves to be the more daring and impressive work. Where Guide thrives on its witty wordplay, physical comedy, and an energetic, Gilbert and Sullivan-esque score, Hearts does something far more interesting – it allows its sociopathic protagonist to wholly have the stage and control the film’s tone and perspective, largely by way of ever-present, carefully crafted voiceover. One would think that this would be an unpleasant experience, but by drawing outcast Louis Mazzini (played with a deliciously dry sensibility by Dennis Price) as a witty, affable, and meticulously reasoned fellow whose pragmatism simply supersedes a moral code, the film allows viewers to simultaneously hold sympathy for him and comfortably denounce his murderous actions. By allowing Mazzini to present himself as a gentleman of sincere intent, the film pulls off a daring trick in creating an antihero who is both quite thoroughly entertaining while being wholly condemnable. It is a tightrope that director Roger Hamer walks with absolute perfection, mirroring Louis’s studied words with equally carefully crafted compositions. 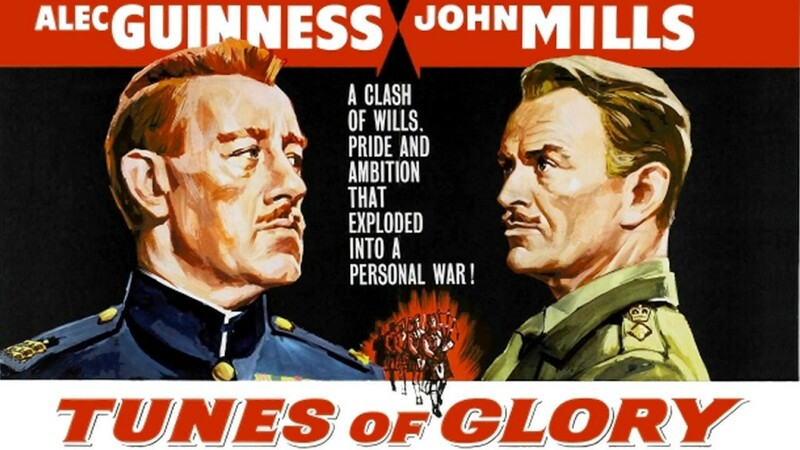 All of this is aided by the presence of the shape shifting Alec Guinness, who plays all eight of the doomed heirs standing between Louis and his goal. What is most impressive about Guinness’s performances are that they are all distinct and amusing, but never distracting. It is clear that Guinness is not concerned with stealing the show, but rather with providing the film with a subtle quirkiness and continuity. To put it another way, his presence throughout the film adds uniformity to the object of Mazzini’s vengeance and furthers the idea that the family shares an ugliness that is simply begging to be eradicated. While Mazzini’s vengeful tactics are clearly unjustified, we nevertheless cannot help but wish for justice to be served and feel a twinge of excitement with him as his victims fall. Thus, by filling the story with a cast full of entertaining and despicable scoundrels, the film once again expertly walks a fine line in making murder equal parts deplorable and enjoyable. Needless to say, it is a one of a kind cinematic experience. Kind Hearts and Coronets screens Monday and Tuesday at 7:00 & 9:00 at the Trylon. Purchase tickets here. The Best Movie in the Best Setting. How Can You Refuse? 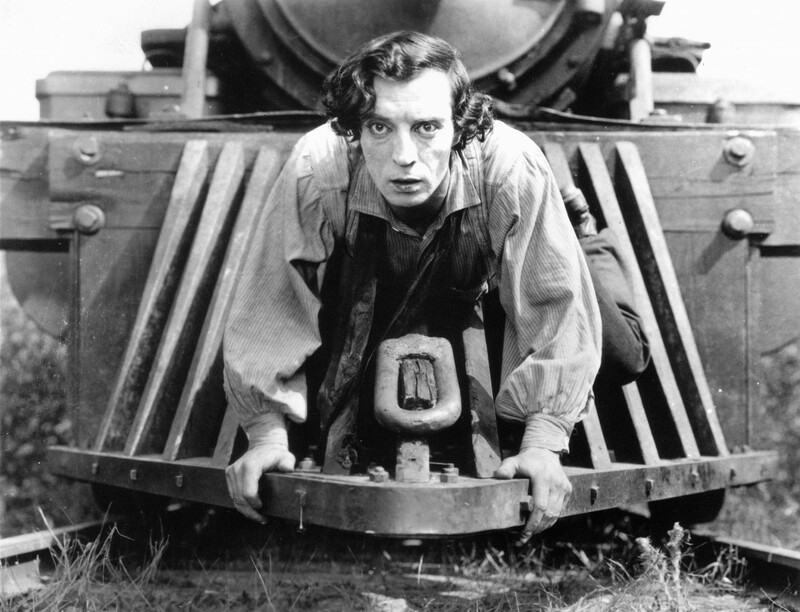 Listen, it’s simple, Buster Keaton’s The General is one of the greatest movies of all time. And the best way to see a movie — especially a comedy — is with a big crowd. And outside? On one of the best days of 2014? Forget it. There is absolutely no way that tonight’s showing of The General isn’t the greatest thing ever. Ever. Live music by frequent Trylon collaborators Dreamland Faces. And we’re working with the excellent group Friends of the Cemetery. Show up early, get your blanket spread out, buy some food from the trucks and settle in for the best thing that ever was or will ever be. 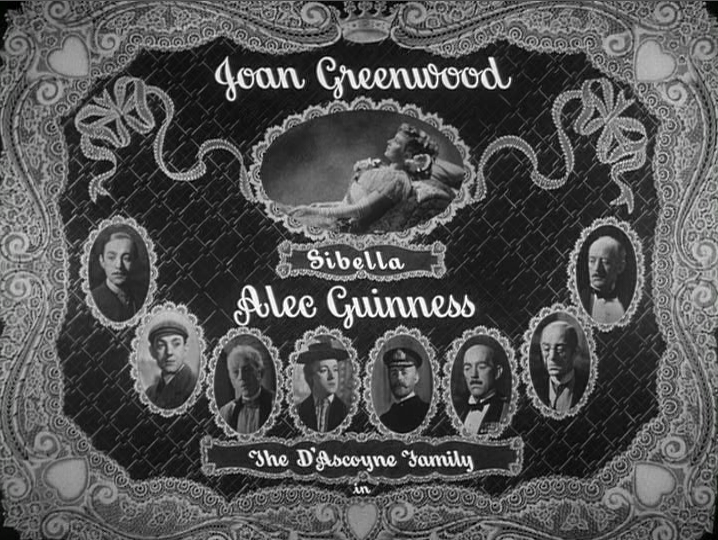 Nearly every Guinness film we’ve shown in this series has been a comedy. But the films that likely turned Alec Guinness into Sir Alec Guinness were his dramas. His big dramas — Kwai, Zhivago, Twist, Arabia — are widely known by film fans. But the lesser seen Tunes of Glory is another stand out that we’re thrilled to be showing as part of this retrospective. Guinness re-teams with director Ronald Neame (they’d made The Horse’s Mouth a couple of years earlier) for this much more down-to-earth story of loyalty, honor and competition in World War II. Weirdly, the trailer isn’t on YouTube, but you can see it at the Criterion Collection.